Today’s photo is of another chapel in the outskirts of Mosta. I had not known about this chapel, and probably would not get to know about it if it wasn’t for my ongoing project documenting the many chapels and smaller churches in Malta. The chapel itself dates back to 1610, and is known locally as “Ta’ Wejda”, in reference to the founder’s nickname. It is dedicated to the Visitation (that Mary, mother of Jesus paid to Elizabeth, mother of John the Baptist), so is more correctly known as Kappella tal-Viżitazzjoni. Like many other chapels on this island, the chapel is now surrounded by buildings (and parked cars), making it tricky to find a suitable perspective. Not too long ago there must have been some countryside around it. It is still in regular use, with weekly Mass held on Sunday mornings. 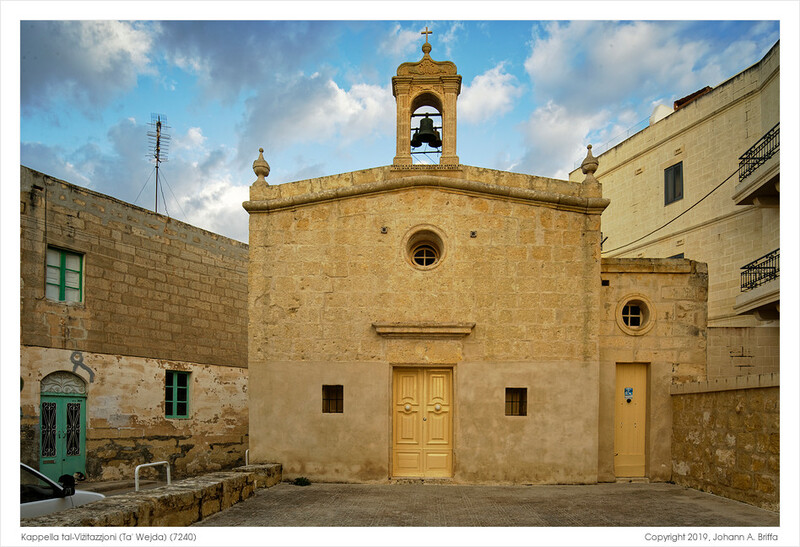 For those interested, you can find considerable information (in Maltese) about this chapel and its history, as well as several photos, on the Kappelli Maltin website. On a technical note, I used the 24mm tilt-shift lens for this photo. It’s really such a pleasure to use this lens, which makes the whole process so straight-forward (yeah, I know, most people wouldn’t think so) for architectural subjects.